T5 Timing belts have small teeth and are generally found in machines such as electronic equipment and power tools such as power sanders, woodworking tools & lathes, electric sharpeners, pumps, and robotic equipment where small timing belts are required. "Trapezoidal" is used to describe the squared shape of the tooth profiles. 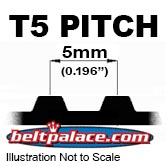 T5 Metric Timing belts are sized by Pitch Type, Outer Circumference (Overall Length), and Width. For example, a “T5” belt 390mm circumference that measures 10mm wide are generally described “T5-390-10”. All belts are Neoprene (black rubber) unless noted otherwise. BANDO and GATES brands are generally Polyurethane construction. We are currently updating these sections... Please call (317) 519-9020 if you don't see what you need. T5-390-10 Industrial Grade Neoprene Timing Belt, Metric Belt T5-390-10, Timing belt: T5-390 x 10mm Wide.